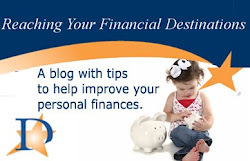 Reaching Your Financial Destinations: Was There A Credit Union At The First Thanksgiving? The short answer is no, there was not. 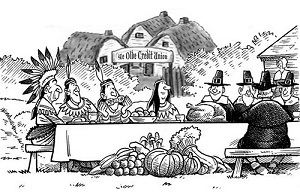 The first Thanksgiving occurred in 1621, which was 150 years before the creation of the first credit unions. In fact, the first modern financial institutions wouldn't reach the country of the Pilgrims' origin until the middle of the 17th century. However, the Pilgrims did believe in many of the principles that would come to define the credit union movement that swept the globe in the 19th and 20th centuries. While the extent of the religious persecution endured by the Pilgrims is a matter of debate, it is clear that they were united by a sense of community and togetherness. Convinced they couldn't maintain the values that most mattered to them if they stayed in England, they risked life and limb to cross the ocean, hoping to build better lives for their families. That's really the basis for credit unions. We believe that, if we work together, we'll all be better off. Destinations Credit Union is made up of members and employees that live in our community. We work together and our kids play together. There's a good chance that, if it's snowing on you, we're shoveling our driveways, too. When the Pilgrims wanted to travel to the New World, it was a difficult and expensive task. A group who wanted to leave Europe would need to find an experienced captain, which was no easy task at a time when crossing the Atlantic took months and often killed those foolhardy souls who were willing to take on the challenge. Then that group needed to pay the crew, save enough food and supplies for the journey and pay all sorts of taxes and fees. In order to come up with enough money to make the trip, they couldn't just get pre-approved online. There was no "online" or "pre-approved" or even a financial institution. Instead, loan decisions were made by the King or a few incredibly wealthy individuals. In today's context, it would be like getting a small loan to start a business but your only choice of lenders were Barack Obama or the owner of your nearest NFL team. The Pilgrims were denied a charter for a new colony by King James I, so they had no choice but to seek out the wealthiest individual they could find. In their case, they secured a loan from Thomas Weston to pay for the trip. Credit unions were first formed for the same reason. As a drought ravaged parts of Switzerland, Austria and Germany, few banks were willing to extend loans to farmers who were unlikely to be able to repay the debts. Of course, that meant that the drought turned into a famine, as farmers who have no food to sell and no capital to buy seeds have little chance to make money, which means they had no opportunity to buy food. The first credit unions extended loans to these farmers, saving their communities from starvation. Suddenly, people realized that they didn't have to be powerless in the face of super-rich individuals who didn't have their best interests at heart. We all learned in grade school that the Pilgrims carried all of their possessions with them, and the historical record confirms that the passengers on the Mayflower were very poor, even for 17th-century colonists, a particularly poverty-stricken lot. So, how on Earth did they secure the loan to head to the New World? It was pretty ugly. The terms of the loan were seven years of indentured servitude. They wouldn't make any profit or own any land for seven years, at the end of which half of the land would revert to Weston and the company to whom he sold shares in the Mayflower voyage. At Destinations Credit Union, we don't have shareholders, we have members. We are not driven to generate profits for the pure sake of looking good on a quarterly report or justify embarrassingly large bonuses that mega-bank executives award themselves. The money generated by your credit union is put into lowering the interest charges on your loans, reducing fees, enhancing our technology and more. You'll never get a loan from us that you'll end up regretting. Of course, Thanksgiving isn't just about Pilgrims. We know a lot more about them than we do the native people with whom they shared dinner that November, but it was the feeling of community and well-being that brought everyone together. While the history of the settlers and the natives would take a very dark turn later, for one night, it really looked like people choosing to help people was the basis on which the groups would work together forever. This Thanksgiving, between the turkey and the football, we hope you'll reflect on the spirit of the day. It's a great time to think about your community and everything for which you're thankful. We're thankful for all of you. We exist to serve a community, and we're thankful to do good work for the people we know and love. We're thankful that somewhere in our history, we all chose to come together and help each other, even if most of us didn't make it to these shores for several centuries after that first Thanksgiving.